The April Book of Me Scrapbook Layouts Challenge will focus on general time lines. We will look at what you did in the Past and then look toward where you might want to be with your Future. Or a comparison of the two, for a Then and Now page. Option #1 - LOOK INTO THE PAST - Where were you born? How many siblings do you have? Did you spend your youth in the same house or town, or did you move around a lot? Layout Idea: Make a scrapbook layout about your childhood, telling your readers what it was like when you were growing up. Whether you had an ideal childhood or not, your early years are an important part of who you are today. Layout Idea: Do some layouts about something special you remember about your childhood. 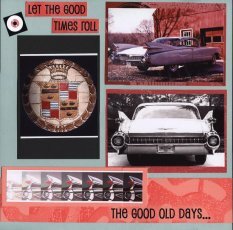 For me, it was Daddy's Cadillac - that 1959 model that was as long as a boat with those huge tail fins! 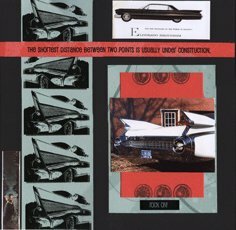 For these Book of Me Scrapbook Layouts, I recently found the old Cadillac sales brochure from 1959 - scanned some of the photos and then added a couple more that highlighted the tail fins. 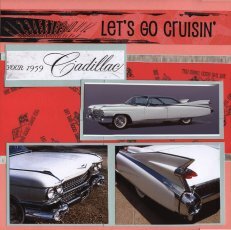 I got the idea for this when I received the August 2008 Cruisin' Kit from Club Scrap.com. It never ceases to amaze me how appropriate for something in my life these wonderful Club Scrap kits are. 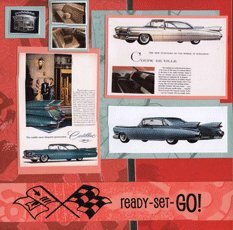 The paper from this kit had images of those giant tail fins and as close as I can tell, it's from a 1959 Cadillac - and the colors of the paper, the mint and corals, were also in that same brochure! I honestly think the designers from Club Scrap have looked into my box of photos and decided to treat me with a kit to match them! By the way, these 4 layouts were already set up by the club Scrap folks with their Assembly Line Scrap Booking method or ALSB. For each kit you can get a group of layouts and instructions for making 10 to 12 layouts from the matching kit products and it makes working on some layouts very fast. While not intended for Book of Me Scrapbook Layouts, they work quite well in this case. I have a recently posted a few more pages from this kit, using some photos from a recent Corvette Car Show. so you can see how versatile these kits are. Option #2 - LOOK TOWARD THE FUTURE – I'm reminded of the Beatles' song, "When I'm Sixty-Four" when I think about the future. Where do you see yourself in 10, 20, 30 years? Of course, none of us knows what will happen tomorrow, let alone years from now, but what would you like to be doing in the future? Choose an age, a span of time, or even a general "When I Retire" theme and focus on your ideal future. Layout Idea: Have fun creating a Book of Me Scrapbook Layouts featuring products we use now and the old-fashioned ones. Photo ideas: Any of the old things that we don’t use anymore. Here’s a fun thing to try: Do some time-line research to check out the prices in effect when some of those old photos were taken. What were the news headlines that year? Make your page look like a newspaper with the title in the form of a headline. What was the popular song back then? What did the cars look like? You can really have fun with this topic and pick up a lot of interesting trivia.